Superman presents Lois with a vial that will give her the same powers he has for a day. She drinks it eagerly. Meanwhile, Krull, a big red monster, attacks the city. Steve Lombard, on the roof of the Daily Planet, laments that the creature has picked up the car he's writing a feature on. Cat Grant pokes fun at him. Jimmy is present, taking pictures. Superman and Lois Lane arrives, from the clouds. As Lois and Superman prepare to do battle, Samson, a large man with dreadlocks in a red and blue suit grabs Krull and throws him into orbit, hitting a satellite. Superman, indicating that the creature's lungs had burst, goes to retrieve him in space. Samson tries to flatter Lois, indicating that his companion would feel the same. He points out Atlas, his blonde, bearded, blue-suited cohort. The two propose a challenge of ages with Superman, where they all perform a task, and the person with the best task wins Lois' company. Samson brags to Lois about what he could offer her, giving her a Uranium necklace. 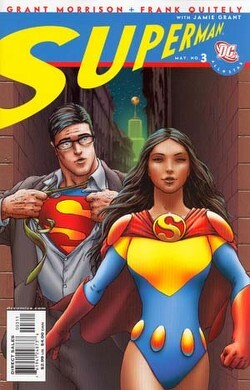 Lois plays Superman, telling him that this is her subtle revenge for lying about Clark Kent for so long. She tells him to have fun. It's her birthday, after all. Samson shows Superman a news headline from the future saying that he's died. A light appears, and as it does, Samson tells Superman that just before his death, he performs twelve feats, including creating life, escaping from the underverse, and overthrowing the tyrant sun. Also, he answered the unanswerable question. The Ultrasphinx, owner of the necklace, returns to take back his prize, putting Lois into a state of suspended quantum animation unless Superman can solve his riddle. The Ultrasphinx accepts the answer and disappears with his necklace. The two continue to goad Superman, who finally comes up with a challenge. He takes them both on at once, arm wrestling. A rock hits Lois on the head and splits. Superman snaps Samson's arm like a twig without any effort. The next day's headline shows him smiling from a hospital bed. Superman takes her to the bottom of the ocean, and then brings her to the moon and kisses her. As Lois' powers wear off, she mumbles about how Superman does a great Clark Kent impression, and asks where Clark was today. She falls asleep, and he puts her to bed. Headlines reveal that Clark Kent wrote the "Superman Dead" headline, and that an ad was where Superman got the answer to the riddle...for the car Lombard lost. Story - 2: Well, there's so much to like here, and so much not to like. It's odd. This is my first review for All Star Superman so far, so here's my general impression, to put this issue into context. Basically, so far it's very hit and miss. What's good is very, very good. What's bad is very, very bad. I think the series, as it comes into context, will make more sense. Like, for instance, at first I thought this was an attempt to do an Ultimate Superman. As I read it, and as I see how it's handled, I begin to see that this is simply the Silver/Golden Age Superman. There's nothing wrong with that. I've been saying we should do a Silver Age side comic for a long time. No reason not to. This fills that hole for me, and I love it for that. That said, there's a lot that this Superman does that the Silver Age Superman might not. Like reveal his identity. Or willfully allow others to come to harm. And also, much as I love Grant Morrison, and indeed, this team (New X-Men is one of the only X titles I've read and enjoyed in the last twelve years), it's half suited for Superman at times. I'll elaborate. First off, generally, there was one thing that REALLY irritated me in this issue. Morrison knows his writing, I know this, and he's going for a purposeful sense of melodrama, from what I can gather. Tongue-in-cheek goodness. That said, I'm still annoyed when someone uses names in dialogue, and he does that here, in this issue, a LOT. It's an amateur convention, and he knows better. And hey, sometimes it makes sense. Like in the arrival of a character. Greeting and goodbye is a good time to use character name in dialogue. But sometimes, it's just used to excess. Ms. Grant. Samson. Superman. And hey, Steve Lombard is used in full once (how often do you address someone by their full name? ), and Lois Lane twice. It dragged me out of the story. The premise is great. Superman giving his powers to Lois. Sometimes this only ends in a bad, arbitrary girl-power story, but here, it's handled pretty well. She enjoys it, appreciates it, but doesn't try and one-up Superman to get a "You go, girl!" I respect that. There's also the fact that this tome is somewhat of the quintessential anti-feminist story, in that Lois is treated for the whole thing as a prize to be tamed, and despite being a feminist icon, doesn't really react or reject this notion. In the Golden and Silver Age, this was more okay, and I think that's what he was going for. Still, it's a bit of an out-dated concept, and one of the things I believe a modern re-envisioning of the Silver Age should lack. Like, you know, sneaky orientals and evil krauts. If those were in here, people would freak. Just the same, the old concept of women being unable to defend themselves (even when superpowered she gets taken easily by Ultrasphinx) and thusly being only a prize is also a notion not worthy of bringing back. What really bugged me most in this issue is Superman playing along with Samson and Atlas after they do some truly heinous things. First, upon his entrance, Samson makes a sentient creature's lungs BURST. It's implied that the creature survives (though how is beyond me), but right then and there, any Superman from any era would put Samson down for the count and end his menace. Especially given that he so easily overpowered them both at the end, proving they were never any threat to him. They also goaded Krull to attack the city. Is that not enough for Superman to want to instantly stop them? No. He plays along with them, and takes their challenges, and almost gets Lois killed. Kind of reckless and irresponsible, even for the carefree Golden Age Supes. There were really cool things from the Golden and Silver Age I love. Like Krull's king instantly knowing and respecting Superman, who's known throughout the universe for his abilities and good deeds. Awesome, old school concept. When Lois is threatened, Superman threatens Samson and Atlas with the Phantom Zone. That's another thing I never liked in any incarnation of Superman, the desire to send a criminal to hell without end just because he doesn't like them. It's an old convention, from back when the Phantom Zone was more of a prison than a hell, so I guess it makes some sense. And threatening Lois is a sure ticket to super-ire. But then, it softens my appreciation for Superman's morality. A great moment is when Superman answers the Sphinx. He's bold, cocky, self-assured, and every inch the Superman from the bygone era. Awesome. It reminds me of the old issues, where every time Superman is set with a seemingly impossible task even despite his powers and has to solve it. In that, this series is the best success in recent memory at evoking that feeling. The answer, however, doesn't really make any sense at all. At least to me. Maybe I'm crazy. Why would either surrender? There's also the fact that Superman, in a fit of cockiness, shatters the men's arms. That's really...not Superman. Period. I mean, maybe Golden Age, in the first few stories, but no Superman I idealize takes joy in breaking arms, even of buttheads. Another confusing moment was the headline: "Greek Hero: Atlas at Lois Party, Atlas Scores!" What the $@%# does THAT mean? So, like I said, this series, so far, evokes a LOT of tender, wonderful imagery that I miss in Superman. And a lot of ideas. But given that there are a lot of critical blunders of story, and a lot of things that really need to be fleshed out more (the writing just isn't up to Morrison par for me), I have to stand by my review for this, and bear in mind, I'm a Morrison fan. Art - 5: Everything in this book has a distinctive flair. I used to HATE Quitely's work for the first few trades of New X-Men. Morrison's writing carried it. And then, slowly, I began to appreciate his work, his distinctive style. I admit it's not for everyone, but it works well for me. His characters are all very distinctive, and he draws a very, very cool Superman. Memorable images from this issue, which will stick in my head, include the streaks of Lois and Superman coming from the clouds, the great image of Krull hitting the satellite, when Superman whirls and calls the guys "morons" (the cape is incredible), and the image of a surprised Lois having a rock hit her head. All awesome stuff, to say nothing of kissing on the moon. GREAT work, and reason enough to buy this series even if Morrison doesn't pull it together. Cover Art - 5: It wasn't working for me when I saw the previews, but looking at it as I write this review, I'm enjoying the heck out of this cover. The Daily Planet in the background is subtle, and the character in the images shown is pretty darned sweet. Probably my favorite besides the solar variant of issue one.